Our Kenwood model was designed for those looking to build a high-quality home on their lot, while not spending too much for all the extra features that some of the other models offer. The Kenwood is simple, spacious, practical and perfect for the family looking to live in an amazingly affordable, brand new home of exceptional quality built where they want to live. Similar to our Kingsmill model home, The Clifton offers customers another choice in a home designed specifically for the practical Homeowner desiring a home where she can make the most out of every inch. Every square foot in this home was designed with a real purpose behind it - whether its adding to your spacious kitchen or Master Bedroom closet or pantry. You'll feel you've received the highest value for your dollar when moving in to your Clifton. 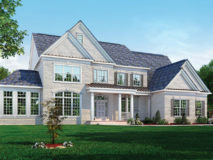 In love with The Hampton floor plan, but don't need quite that large of a home? Well, The Monticello was designed just for your kind of taste. With a similar design as our popular Hampton model, the Monticello is less in square footage while retaining the same great features... and priced less too. 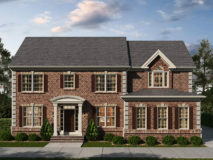 In the Roosevelt model your guests will enter into an incredibly spacious, two-story foyer that opens into the Living Room and Dining Room on either side. This impressively wide open entrance is made possible by the hidden staircase, located just around the corner, almost out of sight. 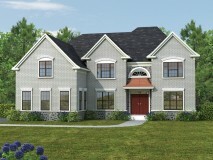 The upper level features a special Loft, in addition to 4 Bedrooms, 2 full Baths, a Laundry Room and 5 walk-in closets. 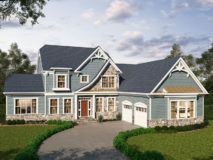 Designed specifically to have that country-side look and old charm of distinguished neighborhoods, The Summerset is a home that will earn respect of your neighbors while not appearing pretentious. With a huge, spacious entry, a 2-story grand Family Room and a first floor Master Suite, it's the utmost in affordable luxury and convenient living for your rather down-to-earth neighborhood. With 4 years in development, tremendous thought from numerous architects went into our most popular floor plan that delivers a home which is almost entirely open, with minimum use of walls and maximum use of windows for interior light. The two-story Family Room floods the house with natural light and creates a very spacious effect. If you are looking for a flowing, open floor plan with high ceilings, you've found the perfect model. This model has the same open and flowing floor plan as The Hampton model. We've designed the Master Bedroom Suite on the first floor with three spacious bedrooms upstairs. 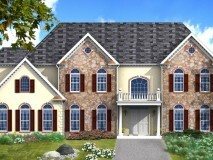 This plan can be modified to have an additional Master Suite on the second floor. If you're looking for the convenience and comfort of having your Master Bedroom on the 1st floor, or if you're looking for a separate In-Laws Suite, this is the right model for you. The Avenel is a new model in our Classic Series. As you enter this lovely home's first floor, the foyer has adjacent Dining and Living Rooms, then opens to a spacious Family Room with an adjoining Study and Guest Suite. The Kitchen has the popular Hidden Pantry along with a large Breakfast area. The second floor's Master Bedroom is inviting with a Sitting Room and spacious Master Bath. Also on the second floor are three additional Bedrooms and 3 full baths. The Lexington was designed with the intention of being open and unique. Standing in the Foyer one can see into the Study, Family room and Kitchen. The angled staircase is set in the middle of the home oriented from side to side allowing for a three hundred and sixty degree view of the first and second floor walking up and down between floors. The second floor offers an over sized Master and Sitting Room, a private bath in the Princess Suite and His and Her bedrooms separated by a shared bath eliminating the hassles of having to share one bath between three different rooms. 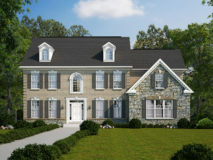 This addition to our Classic Series is strikingly spacious, with a two-story Foyer and Family Room. An extended Study on the first floor can easily be transformed into a full Guest Suite with an added optional Bath. The expansive Kitchen includes our popular Hidden Pantry, and opens to a large Breakfast Area. Upstairs you will find a Master Bedroom with dual walk-in closets, a tray ceiling, and a luxurious Master Bath. The Potomac also features a Jack-and-Jill Bath, shared by two Bedrooms, each with their own vanity and walk-in-closet. The Hampton ll is the expanded version of our most popular model, The Hampton. 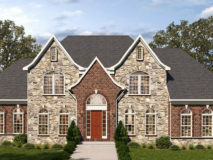 Included features such as an expanded morning room, extended family room and kitchen, 3 car garage and master super bath create an ultimate and spacious floor plan. 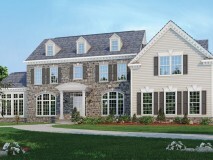 The Rosslyn model is based on our new custom model home – Rock Run. This floorplan was designed to meet recent customer demand for a larger Classic Series model with a modern open layout, and first floor Bedroom. The Rosslyn comes standard with a 3-Car Side Load Garage, and secondary porch/entrance. This inviting, stylish Farmhouse provides a first floor master bedroom, large Great Room and a second floor Bonus Room, to name just a few fabulous features. Perfect for a country setting! "Practical living, exceptional value, comfort in every room"...That's how our Kingsmill Homeowners describe their high-quality, high-usability homes. You'll notice there's hardly an inch of unusable space throughout this model. 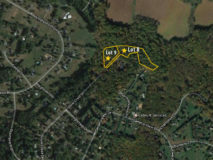 If you're looking for the most value for your dollar, The Kingsmill may just be the perfect home. Consider the optional morning room and playroom/loft for more space for your family to enjoy. The Winterberry was initially designed for lots that could not accommodate a very large or deep home but for the family who wanted plenty of open space and a modern layout. The home has a first floor Library with walk-in closet and full bath, which can serve as a guest room. It also has a spacious Kitchen open to a large breakfast area and Morning Room, perfect for entertaining. Every bedroom has its own private bath. The Master Bedroom is very large, with his and hers closets, huge luxury bath, sitting room with large windows, and a private area for a kitchenette. 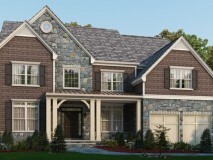 The Winterberry is the perfect model if you desire a home under 5000 sq ft.